Summon: Destroy a creature with 2 power or less. 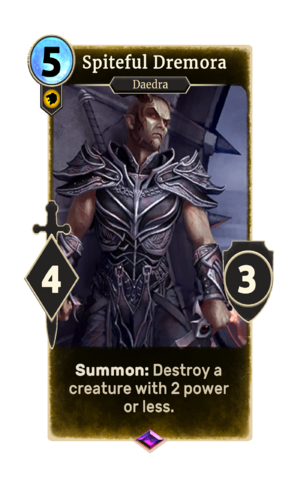 Spiteful Dremora is an epic Willpower creature card. It is part of the Core Set. "I am the emptiness at the center of your hope." This card is named "Deadbringer" in the audio files. This page was last modified on 15 February 2019, at 12:19.